The Azores (Açores) is a group of Portuguese islands in the Atlantic, situated 740 miles from the mainland. The first recorded instance of their discovery is in 1427 by the Portuguese, although there is some evidence to suggest a much earlier date. In 2012, the president of the Portuguese Association of Archeological Research (APIA), Nuno Ribeiro, revealed(c) that rock art had been found on the island of Terceira, supporting his belief that human occupation of the Azores predates the arrival of the Portuguese by many thousands of years. A further article(a) in October 2016 expanded on this matter. Ribeiro’s research was trotted out in a more recent documentary from Amazon Prime with the tabloid title of New Atlantis Documentary – Proof that Left Historians Speechless(u), which explores the claim that the Azores are the mountain tops of sunken Atlantis! It is thought that the Phoenicians and Etruscans competed for control of the Azores in later years. In 2011 APIA archaeologists reported that they had discovered on Terceira island, a significant number of fourth century BC Carthaginian temples. They believe the temples were dedicated to the ancient Phoenician/Carthaginian goddess Tanit(c). The Jesuit Athanasius Kircher in 1665, in his book Mundus Subterraneus, was first to propose that these islands were the mountain peaks of sunken Atlantis. This view was adopted by Ignatius Donnelly and developed by successive writers and still supported by many today. The latest recruit is Carl Martin, who is current working on a book locating Atlantis in the Azores and destroyed around 9620 BC. The late Christian O’Brien was a long-time proponent of the Atlantis in Azores theory. 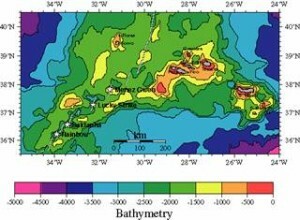 A bathymetric study of the area suggested to O’Brien that the archipelago had been a mid-Atlantic island 480 x 720 km before the end of the last Ice Age. Apart from the inundation caused by the melting of the glaciers he found evidence that seismic activity caused the southern part of this island to sink to a greater degree than the north. O’Brien pointed out that six areas of hot spring fields (associated with volcanic disturbances) are known in the mid-Atlantic ridge area, and four of them lie in the Kane-Atlantis area close to the Azores. In 1982 Peter Warlow suggestedthat a sea level drop of 200 metres would have created an island as large as England and Wales with the present islands of the Azores as its mountains. However, Rodney Castleden contradicts that idea[225.187] saying that if the sea level was lowered by 200m “the Azores would remain separate islands.” Bathymetric mapsof the archipelago, above and on the Internet(g), verify Castleden’s contention. This together with an 1982 paper from P.J.C. Ryall et.al, which demonstrates more clearly that the Azores are just the summits of volcanic seamounts that rise from an underwater plateau that is 1000 metres below sea level. Professor Ryall and his associates were dealing objectively with the geology of the area and were not promoting any view regarding Atlantis. The geological evidence supporting an Azorean Atlantis is therefore very weak, verging on the non-existent. Andrew Collins, the leading proponent of a Cuban Atlantis, has written a short review of the Azorean Hypothesis(h). Frank Joseph has offered his views on Atlantis in the Azores in a YouTube video(l). Nikolai Zhirov recounts in his book[458.363] how Réne Malaise wrote to him regarding a Danish engineer named Frandsen who identified a plateau, 2/3rds the size of Finland, south of the Azores, whose summits were 4,000-5,000m metres higher than it. Adding canals gave Frandsen a configuration that closely matched Plato’s description of Atlantis. Zhirov also noted[p403] that in 1957 a journal entitled Atlantida was published in the Azores. In 1976, Jürgen Spanuth pointed out[015.249] that the Azores are not the mountain peaks of a sunken continent but instead are volcanic rock created through eruption. He quotes similar sentiments expressed by Hans Pettersson. A 2003 paper(b) by four French scientists demonstrated that the Azores had been greatly enlarged during the last Ice Age. 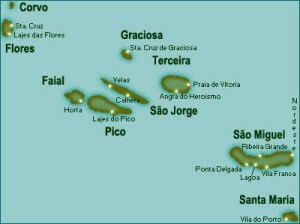 However, showing that the Azores were more extensive is not disputed, but it in no way demonstrates that it was the location of Atlantis. In fact Plato’s description of the magnificent mountains to the north and the mud shoals that were still a hazard in Plato’s day do not match the Azores. The geologist, Darby South, strongly denied that the Azores could have been the location of Atlantis according to a couple of articles posted on the internet some years ago(a). However, natives of the archipelago are quite happy to assert a link with Atlantis, as travel writer David Yeadon found on a visit there(d). Nevertheless, advocates of Atlantis in the Azores must accept that there is very little evidence of human occupation in prehistoric times, apart from the rock art mentioned above. When the Portuguese arrived on the island in the 15thcentury they were found to be uninhabited and without any evidence of an earlier civilisation there. Initially, the only hint of earlier visitors was some 3rd century BC coins from Carthage discovered on the island of Corvo. However, in recent years Bronze Age rock art(f) and what is described as a Carthaginian temple(e) have both been discovered on the island of Terceira. Otto Muck among others, was certain that the enlarged Azores had deflected the Gulf Stream during the Ice Age, contributing to the extent of the western European glaciation. However, a 2016 report(m) from Center for Arctic Gas Hydrate, Climate and Environment (CAGE) offered evidence that the Gulf Stream was not interrupted during the last Ice Age, which would seem to undermine one of Muck’s principal claims. Nevertheless, it is still far from clear what caused the ending of the last Ice Age. A number of writers including Muck speculated that an asteroidal impact in the Atlantic was responsible. When the Azores were discovered in the 15th century they were uninhabited and without any evidence of an earlier civilisation. It can be reasonably argued that since the Azores today are just the mountain peaks of a larger mainly submerged island, any remains would be more likely to be found on the plains and estuaries that are now under water. One undeveloped theory is that the name ‘Azores’ might be linked to the ninth king of Atlantis, Azaes, listed by Plato. This idea is supported by the linguist Dr. Vamos-Toth Bator. However, a Portuguese correspondent has pointed out that the Azores is named after a goshawk (Accipiter gentilis) commonly found on the islands and portrayed on the regional flag. The renowned writer, Dennis Wheatley, used the possibility of Atlantis being located in the Azores as a backdrop to his 1936 thriller, They Found Atlantis. In August 2013 Portuguese American Journal reported that the many pyramidal structures on Pico are clear evidence of extensive human activity in the archipelago long before the arrival of the Portuguese(o). A YouTube video(p) offers some interesting views of the pyramids. The following month the same journal announced the discovery of a pyramidal structure 60 metres high at a depth of 40 metres off the coast of the Azorean island of Terceira(i). Shortly afterwards the Portuguese Navy denied the existence of any such structure(j). Not exactly a surprise! Nevertheless, an Italian website has attempted to breathe new life into the story by linking this underwater pyramid report with pyramidal structures found on the island of Pico(k). The Wikiversity website has an extensive article(s) on the location of Atlantis, which is focused on the Azores and the bathymetric evidence for that archipelago having being a large single landmass at the end of the last Ice Age, when sea levels were much lower. However, it is based on the literal acceptance of Plato’s 9,000 years before Solon for the date of the Atlantean War. April 2018, saw British tabloid interest in Atlantis revived with further speculation on the Azores as the location of Plato’s submerged island(t). However, the details of the claim were rejected by Dr. Richard Waller a lecturer at Keele University. Not content with recycling the old Azores theory, The Star also throws in the even more nonsensical idea of an Antarctican Atlantis.